Every once in a great while, GateWorld gets the chance to conduct an interview where our time with the actor or actress is completely unlimited. It’s great for a variety of reasons, but mainly because we know we’ll get every question answered, and also because the answers that come forth are full and detailed. Such was the case earlier this year with SGU‘s David Blue. We caught up with the actor over the phone earlier this year and as you’ll hear (and/or read), the actor clearly had a lot to say. During our interview, David chats about some of the Eli-centric episodes of Universe‘s final season, what he took away from the production, having Eli go toe-to-toe with McKay, his career going forward, and much more! In addition, he also takes the time to answer a multitude of questions from the members of GateWorld Forum! David Blue: [Laughter] Well, thank you for playing the theme song. It makes me all sad. It reminds me of, like, the first time I heard it, watching the trailer for the premiere. Like, I loved that song. I loved that part of the trailer, so it’s kind of sad. GW: It’s a great tune, actually. I still kind of … I’ve got it on my iPod. I actually still play it every once in a while. Just throw it into the mix. DB: God, I don’t even have it. I really should, though. Well, now it makes … it’s kind of depressing to hear it, though, because it makes me miss everybody and miss the show! GW: Mm-hmm. 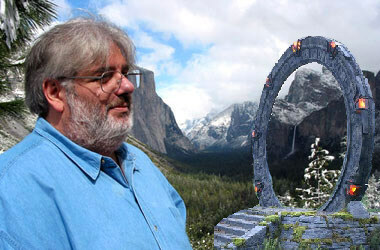 And that’s not in any way … I’m not saying that Joel Goldsmith didn’t contribute heavily to the series. Some of the music, especially in the back half of Season Two that he provided for those last few episodes was hauntingly beautiful. But it just kind of hurt from the beginning — I think, to a degree — that SGU didn’t have a theme that was all its own. DB: Yeah, but I think that’s just a trend nowadays. Just to skip really opening titles because they want to jump right into the content. And if that gives people more stuff to watch then I’m all for it. But it’s really funny. Being the nerd that I am I like to have different ringtones for everybody in my phone. 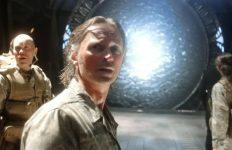 And as soon as we got cast in the show, I got the original Stargate theme and I found a little clip of it and I made that the ringtone for all of the cast and crew of SGU. And it still is. 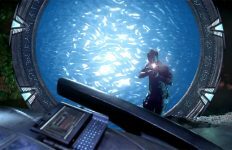 Joel Goldsmith created great music for all three series, but a true main theme for SGU wasn't among them. DB: So — because we don’t have a song — so every time somebody calls me, the SG-1 theme plays. I actually talked with Brian [J. Smith] for his interview … actually, this is the first interview I’ve [recorded] since Brian’s. I talked to him the night before his 30th birthday. And he kind of told us his thoughts about turning the big “3-0.” Did you have any reservations yourself about leaving your twenties behind? The funny thing about being an actor, though, is that you don’t play … I’m lucky. I have good genes. I thank my parents for that. But I look younger than I am. So it makes … it doesn’t feel like I’m my own age, because I can’t play it. A lot of roles that I want to go in for, even this pilot season, are for only 30 year olds or 34 or 35. And they won’t buy me as anything but 25. Which I’m fine with. GW: And you’ve got that baby face. DB: I do. Especially, you know, I find my weight changes whether or not people buy me in certain roles, though. GW: Did you do anything to special to celebrate at all? DB: This year was kind of low-key. I don’t know why. I actually went to this wonderful private club in Los Angeles called The Magic Castle. It’s like a private magician’s club. I went with Neil Grayston, actually, and Alison Haislip and Magda Apanowicz from Caprica. And a few of my select friends. And we just had dinner. It was pretty … pretty low-key this year. I think that’s what happens. The older you get, the more you just want to pretend it’s not your birthday. GW: [Laughter] I hear ya. DB: That was actually possibly my last con. But, yes, I have been. It started out … I really loved the idea after talking to Amanda Tapping and Lexa [Doig] about it. I loved the idea of being out, talking with the fans. And especially when we first premiered. When I first did one in London — or in the U.K., sorry – I liked being able to go out and answer people’s questions and talk back with them about what they liked, what they didn’t like, address some of their concerns. It’s always been fun. And I loved meeting everybody. But it’s just kind of gotten to the point where I kinda need to focus on my career at the moment. And, who knows? There may be cons in the future, but for now, I think I’m taking a little break from them. GW: Well, let’s talk about the series itself. The last time that I talked to you, which was in April of, well, 2010, it would’ve been. Back when Season One was actually still airing on Syfy. And you guys were just getting into production of Season Two. GW: By the end of the series, when the show itself wrapped up, Eli has this internal strength at a level that doesn’t exist at the time of, say, the “Incursion” two-parter. And he spends a decent chunk of those two episodes with a wounded Chloe. Partly because he’s loyal and partly because at that point he had feelings for her. Do you feel like that unrequited love triangle subplot ever really gelled at all? Or was it really like a conscious decision going into Season Two just to drop it? DB: I don’t think it ever dropped at all. I think the whole show is, of course, for Eli, a growth. Not saying the whole show is about Eli. What I mean is, for Eli, the show was a growth process for him. And in the first season, yes, he has this feeling – he has this connection — with Chloe. And it’s a connection he’s never really had before. But I think as he became friends with Scott and as he got to know Chloe, and realize it wasn’t going to happen, it turned into another relationship. And I don’t think it was ever gone. You know, he was still attracted to her, but at that point they became such a family. I think it … and once he met Ginn and realized what love could be, he didn’t let her go. It evolved. It evolved into a different kind of relationship. GW: Going into Season Two did Brad [Wright] and Rob [Cooper] give you any hints prior as to where they’d take the character? Just a rough outline? I mean, Eli was kind of shaped to kind of be the audience’s eyes and ears during that first year as we got to know the characters. But with the heavy-duty character building out of the way was there a plan on how they wanted to build him up in the second year? DB: Oh, sure there was! They knew how they wanted to end the show when they even started the first episode of Season One. They had a plan the whole time. They didn’t tell us their plan. We kind of discovered it as we went. When we started the show they did make it clear to me … I’ll always remember when we did the gun training in the shadow of the Atlantis gate. Which I wasn’t supposed to go to, but I’m a nerd. I love stuff like that. So I asked if I could. And I fired an assault rifle and I looked awesome doing it. And Brad Wright came up to me and is like, “Don’t ever look that cool firing a gun again.” Because he had this idea — they all had this idea — that they wanted to hold off on Eli’s evolution as long as possible. And I think that’s part of why they wanted to make SGU. And why it was a … why we were all attracted to it. This idea of the beginnings and the learning and the growing. Because I love SG-1 and I do love Atlantis. I watched them both. But by the end of SG-1 they were like superheroes. You know? They could solve a problem. Just a get a Z.P.M. and you’re good to go. You know? And they kind of wanted to explore more this idea of people who didn’t know what they were doing – who weren’t supposed to be there. So, long story short — too late! It kinda happens on the way. Blue cites Ginn's death as the catalyst for Eli finally "taking responsibility for himself." GW: I think before you kind of likened that with, like, Michael Shanks’ Daniel Jackson. He starts out Season One basically doing a James Spader rip-off. Which is great at the time, but if you get to the end of the series and then the final two movies, I mean, he’s, you know, buff. He’s shooting a lot. You know, basically an action hero. But, I mean, that’s the unfortunate thing about it. When they got to this point where they knew the technology … they were comfortable with the technology … and especially Atlantis. You know, when you have somebody like McKay on board who can just, “Oh! Let me just quickly bypass this computer and plug into that one.” It almost makes it seem like it’s an easy fix. And I think that they wanted to and we wanted to experiment with the idea of: Well, they might not survive. They don’t know what they’re doing. And with Eli, in Season Two, I think especially because of what happened to Ginn, it just kind of got to the point where he started having to take responsibility for himself. And be strong for himself instead of relying on other people. And that makes you grow up fast. Which he did. I really do miss his acting and the story line. it makes me sad to know its off the air, hope someday before i die it will come back. Eli was one of the few reasons I liked watching the show. A great portrayal of a character with real potential. If it wasn’t for that whole Chloe thing, Eli would’ve been among the best characters in Stargate. He’s good, but the whole Chloe thing was annoying sometimes. 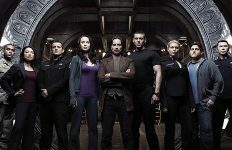 I wish they would revive SGU! David Blue was great. Yes Eli was my favourite too. 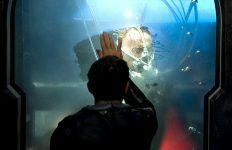 And the actor seems to be a really nice guy – and he likes his scifi :) Agree rsanchez1 that the Chloe story was not interesting nor executed very well. I watched all of season 1 and the last 2 episodes and decided I did nt like universe much because it is nothing like stargate in the slightest and too much drama too dark, and too much like battlestar galactica/caprica that i watched for dark sci fi drama at the same time stargate universe was on and by then I was sick of dark sci-fi drama shows. OH and Eli was just about the only thing I liked on the show all the other characters seemed like huge A-holes and all they did was fight all the time.